While kick-boxing under manager Eric Nolan, California featherweight Kathy Long know as “The Punisher”, defeated some of the best female fighters in the world. Her ring career included wins over Ramona Gatto and Bonnie Canino as well as two defeats of Denise Taylor, and wins over Japanese star Kyoko “Kamikaze” Miyazaki, French champion Dani Rocard and Canadian champion Nora Daigle. 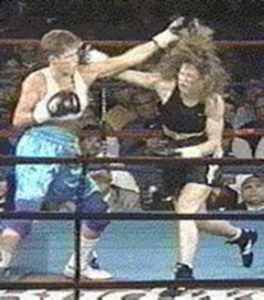 Kathy Long also fought Pixie Elmore to a draw. In a see-saw battle, Long was knocked down twice, in the second and third rounds, but came back to get the better of the “Quiet Tiger” in the late going. A controversial timer’s error ended the final round early, apparently robbing Long of an apparent chance to earn a decision. Kathy Long brought some pizazz to the women’s ring, always playing to the crowd and understanding well how to impress judges with round-ending flurries and flashy action. Some still question her credentials as an authentic warrior. But we think she did a great deal to increase interest in women’s kickboxing, could hang tough when she had to, and made the best of every opportunity she that came her way. She rarely dominated good opposition and she may have lacked a kayo punch, but we think she was a great asset to the ranks of female fighters. Her early retirement took something away from the ISKA/WKA scene, in our opinion. Kathy Long was defeated by Willa Bell in an early fight before turning professional but her only loss as a professional kickboxer came in a Muay Thai match with Britain’s Lisa Howarth at Pickett’s Lock near London in February 1990. There was to have been a rematch later that year and Kathy trained in the Thai style with that in mind. But then Lisa got badly cut in a loss to French savate champion Nancy Joseph, and had to cancel. She now writes for Black Belt magazine, has appeared in several action movies and TV shows, and as a color commentator for the Ultimate Fighting Championship. She is training several male kickboxers. Her long-rumored (no pun intended!) ring comeback as a professional boxer was much anticipated because of her obvious “star value”. Long keeps herself in phenomenal condition, and was thought ready to take on some big names soon if she adjusted quickly to an effective boxing style. Her boxing debut finally came (after many false alarms) on March 10, 1998 in an IFBA-sanctioned lightweight tournament carried live on Cable USA’s Tuesday Night Fights. Kathy Long faced another Californian, Sandra Yard, then 3-0-1, and she turned in a less than spectacular show against Sandy’s significant reach advantage. Kathy was heavier than before (at 126 lbs) and was reportedly coming off a bout with the flu two weeks earlier. She did enough to win a unanimous 4-round decision … but not much more. She landed the harder punches, especially in Round Two, but Yard threw more (but less effective) punches for much of the fight, and was not intimidated by Long. If scored purely on punches landed, like an amateur fight, Kathy might have been in trouble. After her less than dominant performance, the lop-sided (40-36, 39-37, 39-37) decision was booed in the Pikesville, Maryland, Armory. This boxing debut, solid but not dominant against a scrappy novice, left plenty of questions unanswered. Was it just “ring rust”? The flu? Was Long aiming only to land a few “big punches” to control Yard, take the decision, and get out of there? Or did she have real problems with Yard’s reach without her best long-range weapon (her kicks)? Even the fact that she fought with her curly hair flying in her own face (as she had often done as a kickboxer) left some in the boxing community wondering if she was more style than substance. Kathy’s speed was a big component of her kickboxing style, but she was never a devastating puncher and she used kicks rather than punches to control the action and move her opponent. Facing the hard-hitting and skilful Lena Åkesson in the final of this USA/IFBA mini-tournament on March 31, 1998, Kathy went down to only her second pro loss. Åkesson, an experienced boxer trained by one of the masters (Angelo Dundee) also had a reach advantage over Long and used it well to keep Kathy at bay most of the time. After they traded the first two rounds, Åkesson put in a strong third round and Kathy needed a big final round, and to work inside at close quarters to negate Åkesson’s reach. Long couldn’t manage either, and she dropped a unanimous decision by 40-36 on all three cards. This time the scorecards may have been overly severe on her (we saw this as a 39-38 fight for Åkesson). But Åkesson clearly showed that Kathy Long has still to figure out a boxing style that will get her in to the range where she can use her hand speed against bigger opponents in the lightweight division. In this tournament, Kathy showed flashes of the ring presence that had made her a star as a kickboxer. But it may take her much longer to reach the top as a boxer than she realized. On June 26, 1998 she struggled at times in a rematch with Sandy Yard, taking an early knockdown and coming away with only a split decision over four rounds. Frankly, we’re puzzled over why she fought Sandy Yard again so soon, as she had little to gain by another win over Yard but had everything to lose by a poor showing. Her difficulties show how the transition from kickboxing to boxing isn’t easy, even for someone with Kathy’s ring experience and talent. Is Kathy Long’s comeback attempt good for her, or for women’s boxing? It may still be too soon to say. It has certainly helped to fill our mailbox, and she clearly brings extra fan interest to women’s boxing, even as she obviously has a few problems adjusting to it. It will be interesting to see if she now stays what may be a longer course than she expected, to gain a top ranking as a boxer.